The egg yolk yellow in the second photo is remarkable. I’m not sure I’ve seen that color in a sunset before. The sequence as a whole is a good reminder of something I’ve had to learn: sunset is more than the moment the sun drops behind the horizon. The whole show can take a good bit of time, and there isn’t any predicting what will happen even after you think there’s no color left to see. The variety from moment to moment can be remarkable, and you’ve shown it well here. Some of the best colors I’ve seen have come longer than I’d have expected after the sun disappeared below the horizon. In a few cases I’ve experienced two colorful episodes, a pre-set and a post-set with a blander stretch in between. As you say, it can take a while, and sometimes the waiting doesn’t end in anything colorful; because there’s no way to know, what can we do but wait it out? Those are beautiful! Yes, the whole show can take some time, and the colors (and clouds) change rapidly. I forget whether you ever captured any green ray effects at sundown. Would love to see that! Such finery as the sun and clouds conspired to provide. You did! On the other hand… there are the times when you’re driving along and see the most super spectacular amazing sky (clouds or sunsets), but by the time you manage to pull over somewhere, the show is over! All three make a very nice set. The first is my favorite and reminds me of Porter’s cover shot for “In Wildness” although that was a reflection. How interesting that you see a similarity to the In Wildness cover, which I just looked at side by side with the first photograph so I could compare them. I certainly see the similarity in colors. Now if only I could have had leaves floating in my sky…. I noticed one reader’s review of the book on Amazon mistakenly attributes the book’s words to Emerson. Ama el drama (she likes the drama). I do indeed, and I like how this phrase trips off my tongue. Tripping is okay as long as you don’t fall. Was it Daffy Duck who went “Da-trip, da-trip, da-trip”? He was being Robin Hood, as I recall. I had to look it up. You’re right that the song is from Daffy Duck playing Robin Hood. Years ago when I worked at a library, I was making a new library card for a patron whose name was DeTrip. Without thinking I started chanting “Da trip, da trip….” and they said, “Excuse me? !” I don’t think they were amused. I guess you couldn’t help it; the words just came tripping off your tongue. I love it when the setting sun catches the clouds like in your second picture. 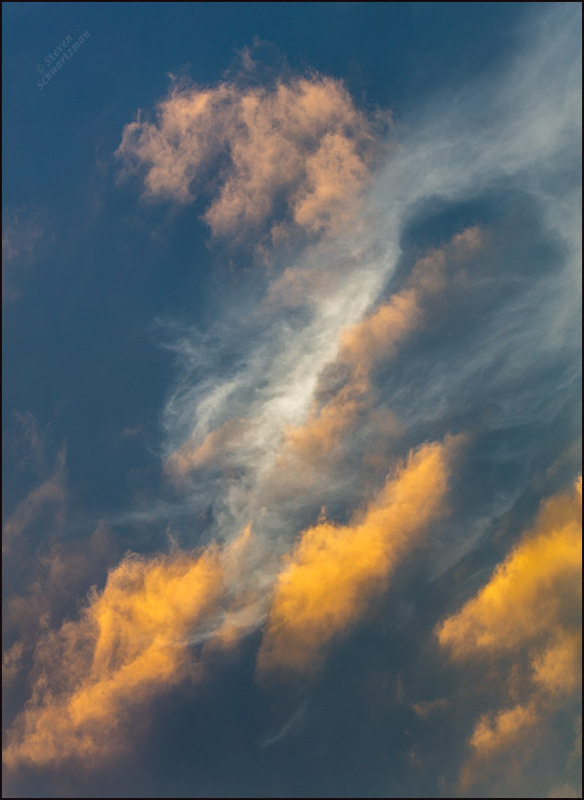 We haven’t had much in the way of sunsets this winter – too much cloud on the horizon – but the other evening I did capture some clouds in the east that had caught some colour. A reminder to me to post an image. I’m not surprised to hear that you’ve had “too much cloud on the horizon” in northern Europe in the winter. Perhaps enough images like the one you’re about to post will rid me of an over-generalization. I like them all, but the combination of colors in the first is very appealing: a blue gradient going to yellow at the bottom, with the contrasting cloud at the top. Pretty. 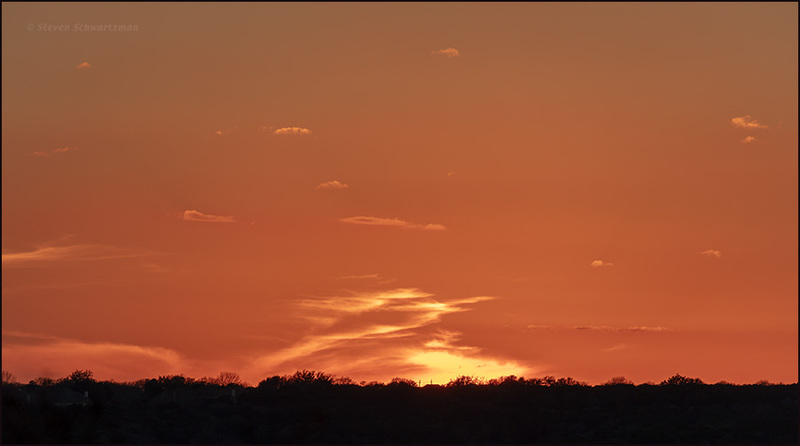 Generally I, and I suppose most photographers, go after the most vivid sunset colors. That’s why I posted the first image, to show that more-subtle colors can also make an effective sunset image. In this case, as you pointed out, there’s a pleasant gradient from top to bottom. 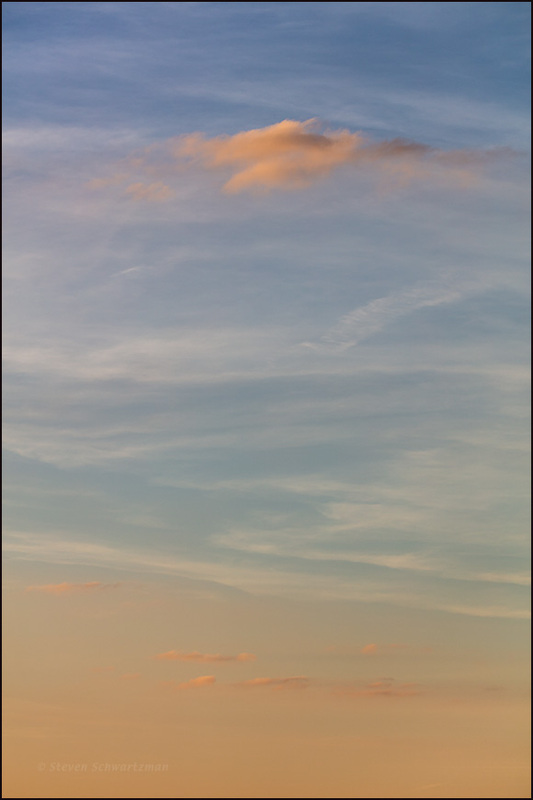 I’m also happy when I can show sunset pictures with a vertical orientation, as most are horizontal. Sure thing. If you know French, ceint is the same word. Thanks for the reminder. La ceinture means belt (Gürtel, in German). Right, and German Gürtel is etymologically the same as English girdle.